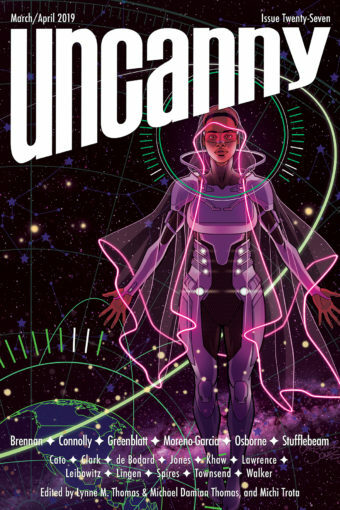 Welcome to Uncanny Magazine Issue Twenty-Seven! All of the content will be available for purchase as an eBook (PDF, EPUB, MOBI) on March 5, 2019. The free online content will be released in two stages—half on March 5 and half on April 2. Featuring all-new short fiction by Karen Osborne, Tina Connolly, Bonnie Jo Stufflebeam, Marie Brennan, Silvia Moreno-Garcia, and A. T. Greenblatt; reprint fiction by Aliette de Bodard; nonfiction by Tracy Townsend, Briana Lawrence, Marissa Lingen, and Suzanne Walker; poems by Beth Cato, D.A. Xiaolin Spires, Cassandra Khaw, Sandi Leibowitz, and Chloe N. Clark; interviews with Bonnie Jo Stufflebeam and A. T. Greenblatt by Caroline M. Yoachim; and Christopher Jones’s Traveler on the cover. Episode 27A (March 5): Editors’ Introduction, “The Dead, In Their Uncontrollable Power” by Karen Osborne as read by Stephanie Malia Morris, “Childhood Memory from the Old Victorian House on Warner” by Beth Cato as read by Erika Ensign, and Lynne M. Thomas interviewing Karen Osborne. Episode 27B (April 2): Editors’ Introduction, “Vīs Dēlendī” by Marie Brennan as read by Erika Ensign, “things you don’t say to city witches” by Cassandra Khaw as read by Stephanie Malia Morris, and Lynne M. Thomas interviewing Marie Brennan. Christopher Jones is a comic book artist best known for his work on Young Justice for DC Comics and on Doctor Who for Titan Comics. Christopher is currently drawing Marvel Action: Spider-man, and recently drew a prequel comic for Young Justice Outsiders written by series co-creator/co-producer Greg Weisman. Christopher’s other work for DC Comics includes a run or more than four years on The Batman Strikes, as well as stories for Batman ‘66, Justice League Adventures, Batman & Robin, Day of Judgment and the cult series Young Heroes in Love. His Doctor Who work includes The Third Doctor: Heralds of Destruction with writer Paul Cornell and The Seventh Doctor: Operation Volcano with writer Andrew Cartmel, in addition to a variety of covers featuring the 13th, 10th and 11th Doctors. 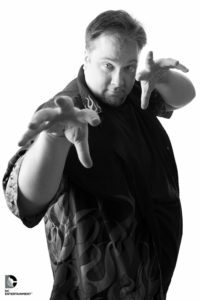 His other work for Marvel Comics includes Avengers: Earth’s Mightiest Heroes and Marvel Superhero Squad. Other comics work includes the graphic novels Also Known As (written by Tony Lee) and Kolchak: Fever Pitch, the SF series Parallel Man, Gargoyles: Bad Guys, and the comic book adaptation of the cult horror favorite Re-Animator. He is also the co-creator of Dr. Blink Superhero Shrink with writer/cartoonist John Kovalic. Christopher also helped found the Minnesota-based sci-fi convention CONvergence and created its robotic mascot Connie.